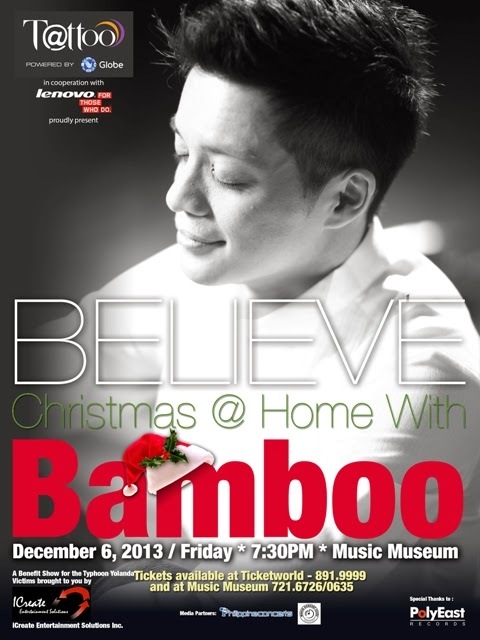 Rock icon Bamboo will kick off the holiday season with a special benefit concert for the victims of Typhoon Yolanda as Globe Tattoo brings you “BELIEVE: Christmas @ Home with Bamboo” on December 6, 2013 at the Music Museum. The one-hour and a half special marks Bamboo’s first Christmas show in his 9 year-old career and highlights intimate set of instruments like xylophone, trombone, percussion, strings joined by a children’s choir for renditions of classic Christmas carols. He will also perform original compositions from his No Water No Moon album released by PolyEast Records. “BELIEVE: Christmas @ Home with Bamboo” is presented by Globe Tattoo in cooperation with Lenovo, a production of iCreate Entertainment Solutions Inc. For ticket information, you may call Music Museum at 721-6726 or 721-0635 or Ticket World at 891-9999. Ticket prices are at P 3,090 P 2,060 P 1,545 P 1,030 P 515.